The most gorgeous rosebush blooms in the backyard at my mom's house. And since I was little, I've absolutely loved picking roses off it in the summer and wearing them in my hair, putting them in vases, crushing the petals into potpourri ... you name it, I've done it. So of course I am totally enamored of Jo Malone Red Roses Bath Oil and Cologne. These two products take the essence of rose and transform it into something absolutely amazing. Because, you know what? We're not just talking one type of rose. We're talking seven. This fragrance takes seven different types of roses from around the world and turns them into an intriguingly delightful bouquet that just envelops your entire being. And with touches of lemon and spearmint, it's just the slightest bit zesty as well. But rather than becoming cloying or heavy, it sits lightly upon the skin and just makes you feel pretty and feminine. And the bath oil? It turns your bathtub into a bubbly mass of heaven! You know what they say ... a rose is a rose is a rose. 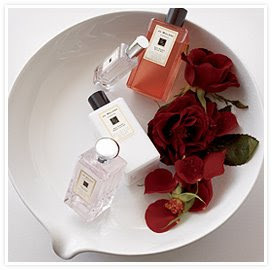 Both the cologne and the bath oil are available on jomalone.com. The cologne is $60 for 30ml and $110 for 100ml, and the bath oil is $65 for 250ml. And throughout the month of October, Jo Malone will donate $15,000 to the Breast Cancer Research Foundation from the sales of these products.